WBA welterweight champion Manny Pacquiao is set to start training for his most lucrative fight since his bout against Floyd Mayweather at the MGM Grand in Las Vegas, Nevada three years ago. While no joint official announcement has been made by the promoters, the fighting senator has announced during the affair of International Sports Promotion Society (ISPS) at Makati Shangrila Hotel on Wednesday evening that he’s fighting Adrien Broner on January 12 or 19, according to Spin.Ph. 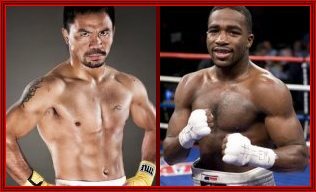 Pacquiao’s choice of Broner as his next opponent is a step in the right direction because the former champion in four weight classes is capable of generating huge revenue for the fight with his exceptional talent of getting fight fans to buy the fight. Pacquiao is done with his legacy fights as he has already proven his capability in the sport that made him the world’s only boxer to win titles in eight different weight classes. His remaining fights are all about money which he needs to sustain and boost his political career. Rumors are swirling that Pacquiao is considering a higher elective government post in the 2022 presidential elections. Aside from being a competitive opponent for Pacquiao, Broner is capable of creating situations in the marketplace where fight fans are enticed to buy tickets to watch him in the ring with his opponent. Combining his skill and talent in hyping fights with his antics, Broner can make substantial contribution in generating more revenues for the fight. With Pacquiao’s entertaining fighting style and Broner’s unorthodox way of promoting and selling his fights, the tune-up to the Pacquiao-Mayweather rematch could be Pacquiao’s highest-grossing event since the Mayweather fight in 2015 at the MGM Grand where he pocketed more than $150 million as his share of the fight purse. Mayweather has announced during his recent visit to Japan where he had a chance meeting with Pacquiao in a common social event they were attending, that he is returning from retirement to face Pacquiao for the second time. In the succeeding weeks following their meeting in Japan, both fighters have opted to do a tune-up fight before finalizing details of their rematch in 2019. Mayweather is yet to announce his opponent for his tune-up fight. Pacquiao (60-7-2, 34 KO’s) is coming off a knockout win over Lucas Matthysse of Argentina on July 15, 2017 while Broner (38-3-2, 24KO’s) settled for a draw against Jessie Vargas last April after losing to Danny Garcia in July last year.